Clarity refers to the presence or absence of inclusions found in the diamond. 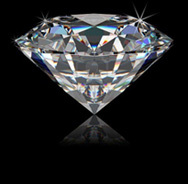 The fewer and smaller the inclusions, the less likely they will interfere with the passage of light through the diamond. Grading for clarity ranges from Flawless to Imperfect. At Donald Haack Diamonds and Fine Gems you will be able to examine the clarity of your diamond under binocular magnification. Free from internal blemishes. No inclusions visible under 10X magnification. Very rare and beautiful diamonds. Very difficult to see flaws or inclusion under 10X magnification. This is an excellent quality diamond. Inclusions are not typically visible and difficult to locate under a 10X magnification. Less expensive than the VVS and IF. Inclusions are easy to locate and very visible under 10X magnification and may be visible with the unaided eye. Still a good diamond value. Medium or large inclusions or external blemishes which are usually obvious to the naked eye under favorable lighting conditions.